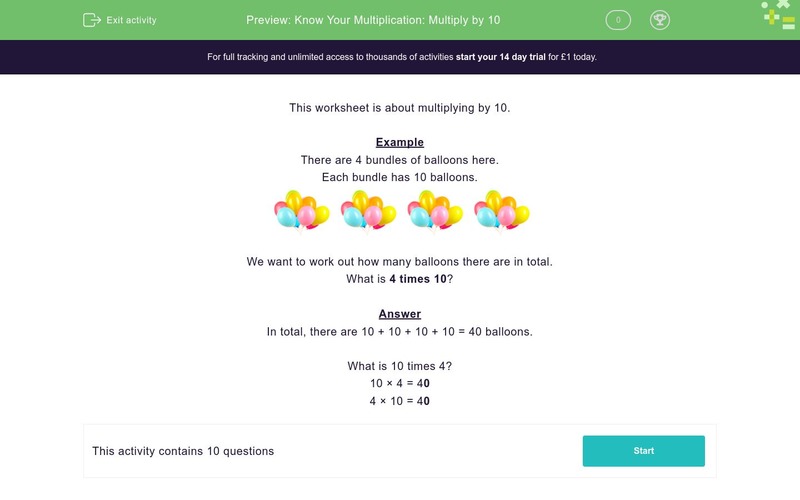 In this worksheet, students multiply by 10. This worksheet is about multiplying by 10. There are 4 bundles of balloons here. Each bundle has 10 balloons. We want to work out how many balloons there are in total. What is 4 times 10? In total, there are 10 + 10 + 10 + 10 = 40 balloons. What is 10 times 4? There are 3 bundles of balloons here. What is 3 times 10? There are 5 bundles of balloons here. What is 5 times 10? There are 2 bundles of balloons here. There are 10 bundles of balloons here. There are 7 bundles of balloons here. What is 7 times 10? Each domino has 10 spots. We want to work out how many spots there are in total. What is 6 times 10? What is 8 times 10? What is 5 × 10 ? What is 9 times 10?